HYDERABAD: Reinforcing the ambitious "Make-In-India" programme of the Indian Government, Hyderabad-based defence & aerospace firm VEM Technologies has delivered an indigenously developed critical component for the BRAHMOS weapon system. The company, which achieved a great leap in manufacturing the complex Pneumo Hydraulic Fuel Feed system used in the BRAHMOS supersonic cruise missile, formally handed over the component to Dr. Sudhir K Mishra, CEO & MD of BrahMos Aerospace on 30th January, 2017. The system, completely developed indigenously starting from raw material to the final product, was handed over by Shri. V Venkata Raju, CMD of VEM Technologies. Dr. Mishra congratulated VEM Technologies for realising the sub-system in a short span of time while complementing the company and its supply partners for the milestone achievement. VEM Technologies is one of the major production partners of BrahMos Aerospace Pvt. Ltd. (BAPL) – the producer of world-class BRAHMOS weapon system. The company has been supplying electronics, power systems and stores separation articles for air and ground versions of BRAHMOS to BAPL. VEM has set up infrastructure facilities for series production of Pneumo Hydraulic systems. 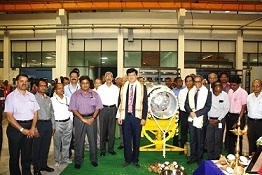 BrahMos Aerospace, the Joint Venture entity between India's DRDO and Russia's NPOM, has established a robust Missile Industrial Complex wherein a large number of public and private sector entities have been associated with the BRAHMOS programme, making the missile a perfect role model of the ambitious "Make-In-India" mission. My priorities will be indigenisation of missile development in India, capacity building for larger production, meeting the production orders ahead of schedule to ensure delivery of missiles on time and to ensure different versions of BRAHMOS missiles to meet the aspirations and requirements of the defence force including Army, Navy & Air Force.